Got time to bake? No? Don't worry, Snack Girl has a great tip for making it look like you have time to use that oven for something other than pots and pan storage. Next to the flour in your supermarket's baking aisle are baking mixes - and one that has been placed there since 1930 is "Jiffy". For a mere 50 cents plus egg and milk, you can make corn muffins. The foodies who read this site are about to flame me for not making my corn muffins from scratch - and I hear you. But, those Jiffy boxes are so cute and while the ingredients include lard and sugar - I like the way they taste. There are other healthier corn muffin mixes (that cost more) on the shelf. Hodgson Mill makes a corn muffin mix as well that has a much cleaner ingredient list. My concept is to take the Jiffy mix and make it healthier by adding vegetables. I also added some cheese because I am sending these to school with my kids and i want to give them a bit more protein. This is a fun and relatively inexpensive muffin that you can freeze and use for a quick lunch, breakfast, or snack. The sugar content on these is a wee bit high for me to deem these super healthy muffins - these are really a treat with some healthy ingredients (not unlike my black bean - brownie mix idea). Have you attempted to alter baking mixes? Please share. Preheat oven to 400F. Mix all the ingredients together in a bowl. Fill paper muffin cups half way and bake for 20 minutes or until golden brown. Vitamuffin makes good cornmuffins that are a bit sweet. You can either get them in 100 calorie packs or as a mix and add egg whites plus whatever other ingredients that you wish and still come out with decent stats. But these sound like a good,cheaper and more accessacle alternative. I bet some peppers would be great in it, if you like it a little spicy. You are definitely not alone. While I try to buy the Hodgson Mill version because it's clean, there is not a corn muffin that tastes any better than the Jiffy one. Seriously...so good...and now that you've added the extra veggies and cheese to them...they must taste even better. What a great way to sneak in veggies for the kiddoes! I <3 Jiffy! I always keep some in my pantry in case I make chili and need some cornbread. I like the idea of adding healthier ingredients to the batter, will have to try doing that. I also add low fat sour cream in place of some of the milk. Gives it a moist, zippy, flavor. My hubby and son love corn muffins and this recipe looks YUMMY. My mother told me the other day she made a brownie mix with 2 cups of grated zucchini and egg in it, no oil or anything else! She topped them with an orange glaze, doesn't that sound great? Snackgirl blog fail. Crap muffin mix plus cheese does not a 'good' snack make. Geesh, Crystal...don't have to be so harsh. If you don't like it, then don't make it! Thanks Snackgirl, for a great idea. Oh my! I am sooooo excited and sooooo broke. This is perfect. I recently was given some zucchini and I just froze some fresh corn I acquired CHEAP! 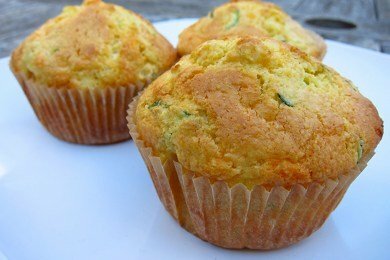 I have to hide zucchini in food from my daughter (must peel, green flakes give it away) and "Jiffy" corn muffins are super cheap. Cha-Ching breakfast for next week....check! I still would not make this. I've left those processed foods a long time ago, along with it's mixes. You just never know what's exactly in it (like the 'natural flavors' on those ingredient lists). I'm with Kathy and Crystal. Lard does not belong here. Oh and I find that non fat Greek yogurt in place of eggs and milk is a good switch. Whenever I make brownies or anything cake like with a mix (I use Vitamuffin deep chocolate brownie mix. Sorry if I sound like a spokesperson for vitamuffin but I really like them if you can tell :) )I usually use 1/2 cup of yogurt and nothing else oe I use egg whites and unsweetened vanilla Almond Breeze. You can use ground flaxseed to replace the egg which also adds fiber.